My bff called me one day and told me that her neighbor was having her fence replaced, and that she was grabbing the materials from the fence they were taking out. And, of course, that it was my job to figure out what to do with it. Understand, we have been responsible for some time for a craft workshop at our church, and when we prepare for it, we need supplies for 300 of each craft. That means that we get very creative in our material sources, and anything cheap or free that we can get in quantity is golden to us. So, ironically, when she called me and told me about the fence, I encouraged her to get as much as she could and we would figure out what to do with it later on. This particular craft was designed from the posts of the fence. We had to cut them down and repaint them, but otherwise they were nice pieces of cedar in which any weathering simply added to the appeal of the final product. 1 - 4" x 4" piece of cedar/wood cut to an 8" length. 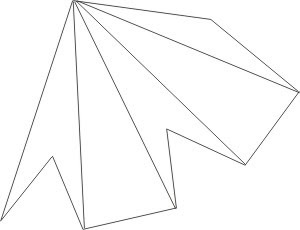 Cut the roof section at a 30/60 degree angle. For tools, you will need sharp scissors, clear-drying glue, and a sharp nail or scoring tool. Depending upon the condition of your 4"x4" piece of wood, you might need to paint it white, perhaps in advance to give it time to dry. 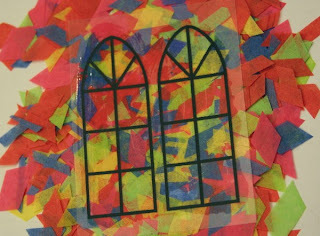 First, spread out the tissue paper evenly, covering an area large enough for the windows. 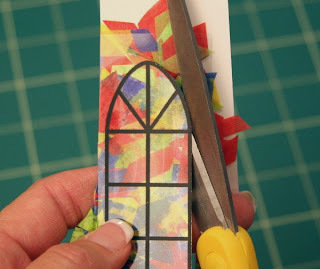 Spread a generous layer of glue on the backside of the window template. Turn the template over and lay it glue-side-down onto the tissue paper and press firmly. 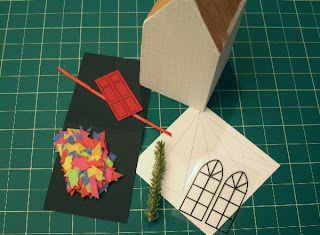 Lift the template and make sure there are no gaps between the pieces of glued tissue paper. 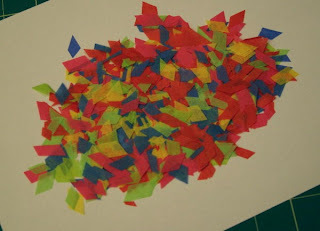 If there are any gaps, finger-press some pieces of tissue into the gaps. 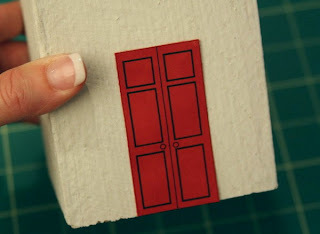 Apply a generous layer of glue onto the piece of white paper. 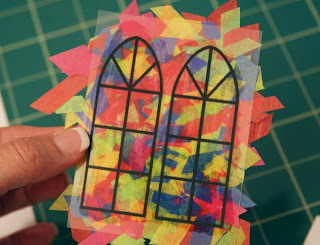 Apply the glued side of the paper to the tissue side of the windows and press together. 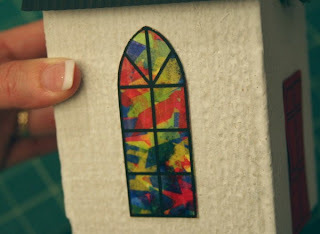 Now, set the windows down on a flat surface and use the wooden chapel piece as a paperweight to hold the window parts together as they dry, while you continue with the next step. Next, cut out the template piece for the steeple. 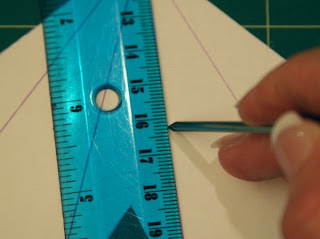 Use a sharp nail or a scoring tool to score the four lines leading out from the top. The deeper the score, the easier the fold, but be careful not to go through the template. Now turn in the steeple sides, folding on the scored lines. Align the open edges, overlapping as indicated and glue in place. 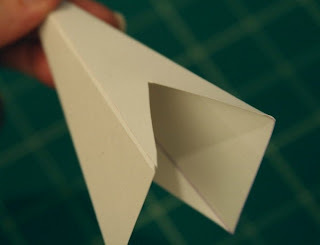 Fold the piece of black cardstock in half. 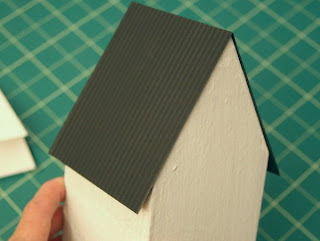 If you have a corrugating tool from your scrapbooking supplies, it adds a nice texture to the roof but it's not necessary. 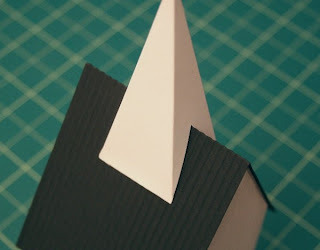 Glue the cardstock to the roof of the chapel, aligning the fold with the peak. Glue the steeple in the center of the roof of the chapel. 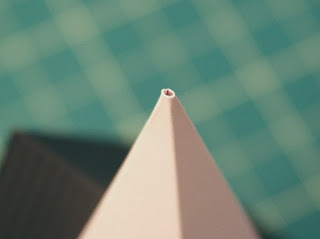 Since only the very bottom of the steeple touches the roof, place a line of glue only along the very bottom edges on the two lowest sides of the steeple. 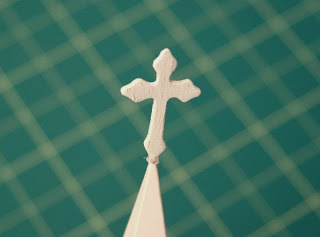 Trim off the tip of the chapel about 1/4" to provide a base for the cross, so that the cross has a little footing to glue on to. Glue the cross onto the top of the steeple. Position the door in the front center and glue in place. 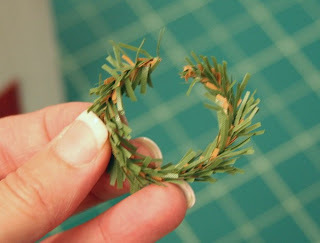 Curl the piece of greenery into a circle and glue the ends together to form a loop. Tie the red ribbon into a bow and glue the bow onto the wreath, covering the glued ends of the greenery if needed. 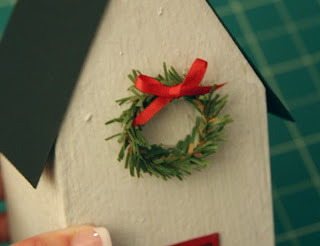 Glue the finished wreath onto the front of the chapel above the door. Optionally, if you'd prefer that this be a non-seasonal craft, you can replace the Christmas wreath with a tiny grapevine wreath. Another idea is to substitute a printed message, such as a bible verse, a greeting, or the name of a church. Now that windows have had a bit of time to dry, cut out the windows, being careful to leave the printed template intact. 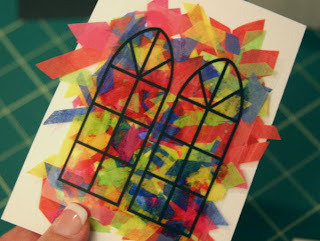 Glue the windows to the sides of the chapel. You're done! Now just find an appropriate place to put it, or even better, a wonderful person to give it too.